Greasy hands, messy towels, uneven application--No Problem! Well-dressed tires are the envy of those who know cars, but attaining them is easier said than done. Tire dressing is inherently a messy product, but you don’t have to sacrifice tidiness to get great tires anymore. The Tire & Trim Applicator thankfully takes the mess out of the dress. 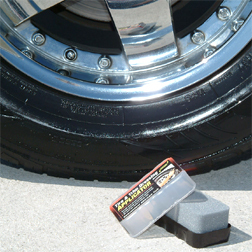 Sturdy, durable foam is securely housed in a palm-sized, rectangular handle with finger grooves to eliminate slippage. This particular grade of foam was selected for smooth, even application without dripping. The design of the applicator makes it easy to control and target specific areas. Achieving good-looking tires have never been easier or cleaner. This applicator also is terrific for attending to your trim. The applicator is conveniently packaged in a snug storage tub, which protects it between uses. The lid simply fits right onto the handle and snaps in place. Use again and again and again…. Like other comments, foam fell out of handle on first use. Autogeek product experiences always good, but this product should be eliminated from the lineup! Works nice on my low profile 18s and applies easy. Favorite part is how I don't get product on my hands now, favorite applicator out of many ones I have tried. I got this for tire gel application, the foam is softer than anticipated, so when you press it on a tire it collapses down to the grip. I think this would be better just as a trim dressing applicator and not tires its just too soft. Good little tool to get various size tires, with a handy protective cover and built in plastic handle to keep it from being messy to handle. ProsProtective case for no mess storage, good size to get both low profile tires and standard profile tires, handle is separate from foam for a mess-free use (hands don't get full of tire dressing). ConsFoam compresses a bit too much, so the plastic handle portion constantly hits the tire. I can adjust my technique no problem, just thought the foam could be stiffer.